We’d love your help. Let us know what’s wrong with this preview of Wish You Were Here by Rita Mae Brown. To ask other readers questions about Wish You Were Here, please sign up. What age is this book appropriate for? What bad things are in it? Mercurybard I was reading this at 12-13 and my parents were extremely strict about monitoring content, so it should be fine for YA readers. I don't know how many…moreI was reading this at 12-13 and my parents were extremely strict about monitoring content, so it should be fine for YA readers. I picked this book out on a whim...didn't know what to expect at all. Virginia Beach Public Library had it as one of the Staff Picks on their e-book collections, so I thought, why not? Most of the books in this series take place in Crozet, Virginia (which also intrigued me, since I go by Crozet every time I go see my family in Ohio and West Virginia). This first book in the series I found a little crude at first (a lot of unnecessary swearing), but it gets better throughout the story. Another th I picked this book out on a whim...didn't know what to expect at all. Virginia Beach Public Library had it as one of the Staff Picks on their e-book collections, so I thought, why not? Most of the books in this series take place in Crozet, Virginia (which also intrigued me, since I go by Crozet every time I go see my family in Ohio and West Virginia). This first book in the series I found a little crude at first (a lot of unnecessary swearing), but it gets better throughout the story. Another thing that seems odd at first is that the animals talk to each other. Sounds kind of childish, but these animals don't have childish thoughts. They are very smart, and they help solve the murders that keep happening around them, with their keen senses that the humans don't possess. I started reading the Mrs. Murphy series years ago before I had kids and life got incredi-busy. Somewhere in the middle of the series I got so busy with life (darn adulting!) and lost connection with this series. I popped back in a year or so ago and reviewed a couple of the newer books. This year...since I declared 2018 to be a Read-Whatever-the-Heck-I-Want-To Year....I decided to re-read some favorite books and series. The Mrs. Murphy series was right near the top of the list! I loved these bo I started reading the Mrs. Murphy series years ago before I had kids and life got incredi-busy. Somewhere in the middle of the series I got so busy with life (darn adulting!) and lost connection with this series. I popped back in a year or so ago and reviewed a couple of the newer books. This year...since I declared 2018 to be a Read-Whatever-the-Heck-I-Want-To Year....I decided to re-read some favorite books and series. The Mrs. Murphy series was right near the top of the list! I loved these books....and I'm happy to be re-visiting Crozet, VA and its quirky residents once again. There are 26 books in the series. Wish You Were Here started it all back in 1990. Mary Minor "Harry'' Harristeen is the postmistress of Crozet. She's smack dab in the middle of a slightly messy divorce from her Veternarian husband, Fair. And being a small VA town, locals are gossiping up a storm about her and the situation. Harry tries to keep calm, enjoying the company of her fur babies -- Mrs. Murphy (a tiger striped tabby) and Tee Tucker (a Welsh Corgi). Suddenly, a string of murders takes the town's attention off Harry's divorce. Harry (who has a habit of reading postcards while working in the post office) knows that each of the victims received a post card before their demise with a strange cemetery picture on the front and "Wish You Were Here'' written on the back. Harry immediately starts a bit of amateur sleuthing to ferret out the killer's identity. Mrs. Murphy, Tucker and their furry friends try to help, but it's a bit difficult as humans are too stupid to understand what's being said to them (Mrs. Murphy's opinion....not mine ha ha). Harry, unfortunately, doesn't think about the fact that her poking her nose in might turn the killer's attention to her...... Oops. I love this series! Rita Mae Brown interjects a lot of her personal beliefs about land use, politics, taxes, feminism and other subjects.....but I don't care. The characters are engaging and definitely give a peek into affluent, small town southern life. Some of the side characters are a complete snooty turn off....but it all mixes well into the plot. I like the mix of human and animal points of view. Mrs. Murphy and Tee Tucker are main characters just as much as Harry. In later books, Brown interjected a bit too much of her personal thoughts and muddied up the stories too much with her rants.......but the first few books are more story/less rant. I listened to the audio book version of this story. Narrated by Kate Forbes, the audio from Recorded Books, Inc is just over 8 hours long. Forbes has a nice voice and does a good job with character voices. I have partial hearing loss, but was easily able to hear and understand this entire book. Very enjoyable listening experience! 1. The very first thing that was very annoying to me in the beginning was all the characters thrown in the first chapters so soon. It was kind of hard for me to keep up with who was who and I found myself constantly having to go back to the list of characters. 2. The character names were very weird. "Boom Boom"? I wonder where the author came up with them. 3. I was looking for more mystery and action in this book. Sadly it fell short on that aspect. Two gruesome murders / mutilations have the residents of Crozet, Virginia in a tizzy. Postmistress Mary Minor “Harry” Haristeen has the only clue – a day or two before they were killed, each of the victims received a postcard of a famous cemetery or tomb with a “Wish you were here” inscription. This book introduces the Mrs Murphy mystery series. Mrs Murphy is a tiger cat, whose “mommy” is Harry. Along with her Welsh corgi companion, Tee Tucker, the animals help Harry find the killer. When it comes to the central murder mystery, there really are very few clues other than the postcards and the use of cyanide. More of the book is spent on dissecting Harry’s failing marriage and her soon-to-be-ex-husband’s affair with an old high school flame. And then we have the animals and their role in the case. As if anthropomorphizing the animals weren’t enough, Brown also goes off on tangents about the environment, politics, feminism, racism, etc. And some of these tangents are voiced by the animals. PUH LEEZE … The final solution is rushed – set-up and resolved in the last ten pages. On the plus side, it’s a fairly fast read and Harry is an interesting character. While she’s suffering the hurts of a broken relationship, she is generally a strong, independent woman and I appreciate that. But it IS supposed to be a murder mystery, so I’d like more mystery and less social commentary. YIKES what a stinker. I read this for the "mystery written by LGBT author" bit of the Read Harder challenge and I regret it deeply. Part of this is that I've never read cozy mysteries so I now know I am super not a fan. But also, the characters were so vapid and weak that I found myself rushing to the sections where the corgi and his cat friend solve the mystery, which is probably not how the book was supposed to be read. Also, was super not a fan of the weird casual racism in certain parts of t YIKES what a stinker. I read this for the "mystery written by LGBT author" bit of the Read Harder challenge and I regret it deeply. Part of this is that I've never read cozy mysteries so I now know I am super not a fan. But also, the characters were so vapid and weak that I found myself rushing to the sections where the corgi and his cat friend solve the mystery, which is probably not how the book was supposed to be read. Also, was super not a fan of the weird casual racism in certain parts of the book, or the general bodyshaming comments that played an oddly significant role throughout (which, of course, was only targeted at women). I get it. One of the characters is overweight. And honestly the character development was so bad that that was the only thing I knew about her. Another thing -- THERE IS A CHARACTER NAMED BOOMBOOM AND NO ONE ADDRESSES IT. These books clearly have a number of devoted followers, but I barely made it through this first one. This is largely due to expectations of tone - when a cat and dog are trying to solve crimes, I would expect a fairly light read. However, I found most of this book pretty depressing. The characters are largely unlikeable, the main character's divorce drags down both the speed of the narrative and the overall mood, and the animals spend most of the time philosophizing about the horrors of the huma These books clearly have a number of devoted followers, but I barely made it through this first one. This is largely due to expectations of tone - when a cat and dog are trying to solve crimes, I would expect a fairly light read. However, I found most of this book pretty depressing. The characters are largely unlikeable, the main character's divorce drags down both the speed of the narrative and the overall mood, and the animals spend most of the time philosophizing about the horrors of the human condition as regards nature, family, and the mentally ill. There is a mystery in there, but the lack of communication between the (extremely erudite) animals and their human owner is strange and frustrating. This is the first book in the series and it seemed strange reading it because things do progress over time in Crozet and I have read all of the more recent books. Don't know how I missed this one. This was one of those books I stayed up late for because I just had to finish it. I didn't care for it so much in the beginning but obviously by the end I was anxious to finish it and enjoying every minute of it. Harry (Mary Minor Harristeen) is the postmistress of Crozet and has two loyal and lovable p This is the first book in the series and it seemed strange reading it because things do progress over time in Crozet and I have read all of the more recent books. Don't know how I missed this one. This was one of those books I stayed up late for because I just had to finish it. I didn't care for it so much in the beginning but obviously by the end I was anxious to finish it and enjoying every minute of it. Harry (Mary Minor Harristeen) is the postmistress of Crozet and has two loyal and lovable pet companions who go almost everywhere with her. They are Mrs. Murphy the cat, and Tee Tucker, a corgi. The animals have a friend, Pewter, who belongs to the store owner next door and loves to share in the gossip with the other two. The animals can communicate with each other but are unable to "talk" to Harry so have to try to discover other ways to help her solve the mystery of the murders in Crozet. I honestly can't decide if I want to continue with this series. I'm not a prude, I'm a high school librarian for crying out loud, but the crassness of the language in this book is very out of character for the setting that is portrayed. It just doesn't mesh for me nor does it make it a pleasant cozy read. It became better in the second part of the book but I wondered if the author had a "curse word" quota she was trying to fill in the first 25 pages of the book. I finally got around to reading this book, it's been in my TBR pile for a while and I'm not quite sure where to start - I think this is actually a fairly decent start to a series. I loved the animal characters but the human ones took a while to get used to. For a cozy it wasn't as light-hearted or well cozy as I'd expected (it wasn't dark). The mystery was fairly easy to figure out and I managed it less than halfway through the book. It could have used more descriptions (I still don't really kno I finally got around to reading this book, it's been in my TBR pile for a while and I'm not quite sure where to start - I think this is actually a fairly decent start to a series. I loved the animal characters but the human ones took a while to get used to. For a cozy it wasn't as light-hearted or well cozy as I'd expected (it wasn't dark). The mystery was fairly easy to figure out and I managed it less than halfway through the book. It could have used more descriptions (I still don't really know how the majority of the characters look - except the animals). It also tended to get overwhelmed at times from the perspective shifts and the personal dramas playing through. The drama's are a bit unnecessary and at times taxing. It's a personal preference - I just didn't want to hear about Harry's divorce (especially this one which popped up enough for me to roll my eyes when it did) or Mim's superior, racist and unpleasant attitude, who was having an affair with whom (also easy to spot). But it did give the main characters more distinction from the minor ones (and there were quite a few of both main and minor characters). The characters were also introduced in excess in the beginning (I had to write them down to keep them all straight), not just the human ones but also the animal ones. Other than those issues - it is a decent, good story - a bit obvious and a little dated but not bad, not the best but not the worst either. What this story does have going for it is Mrs. Murphy & Tee Tucker - who made for really great main characters - I enjoyed them a great deal. As well as Pewter - another cat. Oh and the animals can speak, think and understand each other (and the humans - though the humans can't understand them) - this is not something I've seen in other stories - I liked it. Harry grew on me - she hasn't really fully formed as a character in my mind yet but I'm not opposed to getting to know her better - she's sensible, dependable, a few tantrums but a little bland right now - we don't really know what makes her tick as yet. Despite my harping about all the characters you do get a sense of the community and people when you read the book which I did come to like. We even got to know a few other characters a bit more and I look forward to seeing them in future installments. Not to sure how I feel about Harry's soon to be ex and BoomBoom (Seriously, that's her name). What I'm feeling is a whole lot of mixed feelings for the characters (good thing - I think), who were all like people you could know in your life. And more importantly I want to see these characters again (most of them anyway). Especially the animals. Eine beschauliche Kleinstadt in Virginia, wo jeder noch seinen Nachbarn kennt und das Verbrechen lediglich Erzählungen aus den Medien sind, ist das Zuhause der Postlerin Mary Minor Harristeen, die nur Harry gerufen wird. Sie lebt dort zusammen mit ihrer Katze Mrs. Murphy und ihrem Corgi Tee Tucker. Harry und ihre unspektakuläre Scheidung von Fair sind zur Zeit der größte Skandal, den das Städtchen zu bieten hat, bis der Bauunternehmer Kelly tot in einer Betonmischmaschine gefunden wird und es sehr schnell klar ist, dass dies kein Unfall war. Mit viel Spürsinn machen sich Harry, Mrs. Murphy und Tee Tucker daran, ihre eigenen Ermittlungen aufzunehmen. Ein richtig schöner Krimi, dem es weder an Spannung noch an Humor fehlt. Ob man möchte oder nicht, man muss Harry und ihre beiden tierischen Freunde einfach ins Herz schließen. Anfangs haben mich die vielen Personen, die im Postamt eintrudeln etwas verwirrt, aber es gab Vorne im Buch ein Personenregister, das mir sehr nützliche Dienste erwies. Kaum hatte ich die Personen im Kopf, stand dem Vergnügen nichts mehr im Wege. Sehr gut haben mir auch die Einblicke in die Konversation und Gedankenwelt von Mrs. Murphy, Tee Tucker und der dicken Katze Pewster gefallen. Es ist der Autorin gut geglückt, das plötzliche Unbehagen und das schleichende Misstrauen, dass sich gegen nette Nachbarn und Bekannte richtet, die man schon ein Leben lang kennt und die alle als mögliche Täter in Betracht kommen. Mich konnten Mrs. Murphy, Tucker und Harry völlig überzeugen und ich freue mich schon auf den nächsten Teil. I liked "Wish You Were Here" more than two stars reflect. I finally procured Rita Mae Brown's series-opening novel, having stalled a few pieces I've had, for years. It took several chapters to know how I was taking to it because they oversaw an introduction to townspeople. In 1990, I was happy to remember, a post office was a centre of community. I continue to utilize mail, maintain hopes of receiving it, and vacations aren't complete until I send postcards to close friends and family. I don't sh I liked "Wish You Were Here" more than two stars reflect. I finally procured Rita Mae Brown's series-opening novel, having stalled a few pieces I've had, for years. It took several chapters to know how I was taking to it because they oversaw an introduction to townspeople. In 1990, I was happy to remember, a post office was a centre of community. I continue to utilize mail, maintain hopes of receiving it, and vacations aren't complete until I send postcards to close friends and family. I don't share Rita's interpretation of pet attitudes; definitely not about killing offspring. Such a distasteful note had no place. I enjoyed her demonstration that animals think and protect us. It was creative for Harry's pets to run the book and Rita's cat to be co-author. Conferences among Crozet animals predate a popular animal series by Susan Wittig Albert. We might infer that if Crozet is real, the pivotal history could be too. I love fiction for its potential to be instructive. Some people disliked meeting numerous townspeople but in this novel, it was necessary. Their reaction to murder is assessed. A connection with them that grows and shifts the more we deal with them, is measurable like real life and I admired that. First book in a very, very long series! But I guess that means that these books are great. Well, I have to say, I certainly enjoyed this first! The writing style is great, loved the interaction between the animals. I am always curious how animals play a part in a book and how one learns what they are saying/thinking. Really liked how this was done in this book. I myself have 2 cats and 1 dog and I could relate to Harry seeing her animals do things and having no real clue what they meant. I also v First book in a very, very long series! But I guess that means that these books are great. Well, I have to say, I certainly enjoyed this first! The writing style is great, loved the interaction between the animals. I am always curious how animals play a part in a book and how one learns what they are saying/thinking. Really liked how this was done in this book. I myself have 2 cats and 1 dog and I could relate to Harry seeing her animals do things and having no real clue what they meant. I also very much loved the fact that there was background information on the founder of Crozet, it gave a touch so to say. The relations between the townspeople was also told and i really like that a lot because you can relate to them or understand better why people react the way they do. What I mostly loved was the way the killer would let people know they were on his/her list. Postcards! Now, I am a big lover of the Postcrossing project, so this was great for me! Loved it! The third murder however came as a huge surprise! But I did get sad that the dog of this person also got killed. I somehow feel really sad when animals die, even in fiction books. What I did not like was that in the first chapter, you get to meet all the characters at once. Fine, but with the amount of characters that live in Crozet and are of importance to the story it's a bit.... much on information! The murders were well written, but it lacked action. Yes, Harry fears for what may happen, but there is no real noticeable threat. If there had been multiple hints dropped towards Harry for her to feel like she was the next on the list because she 'snoops around', it would have given more action and tense. This book really was not good. It was "written by a cat" and honestly, with the writing and sudden topic shifts, it probably was written by Brown's cat. I won't be reading another one of these. It was mildly enjoyable... in the guilty-pleasure realm but also in the I'm-so-ready-for-this-to-be-over realm. It was a cutesy bad read. This is a very cute book, and enjoyed reading it. (I wasn't sure when it started with a cast of characters... I hate feeling like I have to do my homework before reading a book.) The interactions between the pets especially amuses me. This story was absolutely delightful. A fun little mystery with lots of colorful and interesting characters, and part of the tale is told by a couple of cats and a wee Corgi. Very relaxing, and thoroughly enjoyable in every way. I read this book for the 2018 Read Harder Challenge - Task 21: A mystery by a person of color or LGBTQ+ author. It was super bizarre when I realized the animals were the ones speaking at times! it was fun and lighthearted, but not a series I plan to return to. This is a great series if you like animals involved with the story. Mrs Murphy and Tee Tucker are great. Pewter is fun to, I think her sister might live at my house. 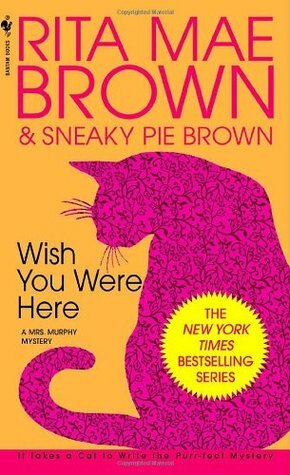 Wish You Were Here is the first Mrs. Murphy mystery and leads to a long series of murder mystery's solved by Mrs. Murphy the cat and Tucker the Corgi and all of their cat and dog friends in the town of Crozet VA. with the help of their 'Mom' Mary Minor Haristeen. better known as Harry the Postmistress. When people in the town begin to receive postcards with pictures of grave stones and are then found dead, Mrs. Murphy is soon on the prowl. Kind of a hoot! Perfect holiday break reading.